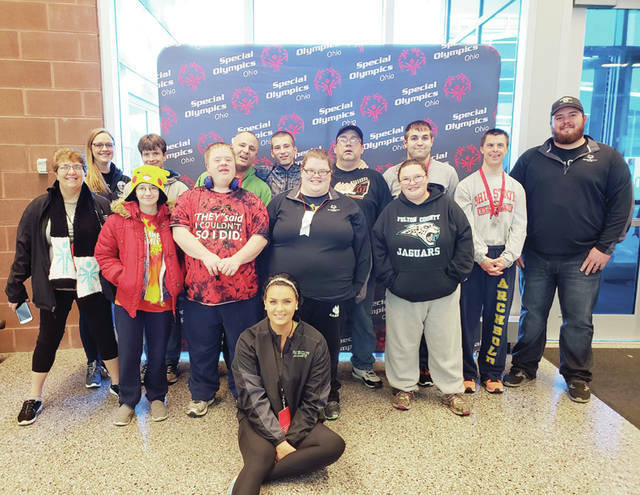 The Fulton County Special Olympics swim team traveled to Columbus last weekend to compete in the 47th Annual Ohio Special Olympics State Swim Meet at Ohio State University’s McCorkle Aquatic Pavilion. Everyone on the Jaguars team received medals and ribbons from their races, but the big winners were: Dillon Hayward, Wauseon, gold, in his 50M freestyle and silver in his 50M backstroke; Hannah Shotwell, Delta, third place, in her 50M freestyle; Braydon Ringle, Swanton, bronze, for his 25M freestyle; and first-year swimmers Andy Dietz, Archbold, and Joel Reinking, Wauseon, bronze, for their 25M freestyles. The silver-winning 4 x 25M relay team included Andy Dietz, Archbold; Aric Gurzynski, Wauseon; Chad Kutzli, Wauseon; and Nick Weigand, Archbold. https://www.fcnews.org/wp-content/uploads/sites/45/2018/12/web1_special-olympics.jpgThe Fulton County Special Olympics swim team traveled to Columbus last weekend to compete in the 47th Annual Ohio Special Olympics State Swim Meet at Ohio State University’s McCorkle Aquatic Pavilion. Everyone on the Jaguars team received medals and ribbons from their races, but the big winners were: Dillon Hayward, Wauseon, gold, in his 50M freestyle and silver in his 50M backstroke; Hannah Shotwell, Delta, third place, in her 50M freestyle; Braydon Ringle, Swanton, bronze, for his 25M freestyle; and first-year swimmers Andy Dietz, Archbold, and Joel Reinking, Wauseon, bronze, for their 25M freestyles. The silver-winning 4 x 25M relay team included Andy Dietz, Archbold; Aric Gurzynski, Wauseon; Chad Kutzli, Wauseon; and Nick Weigand, Archbold.